It’s not perfect yet, but we wanted to make you part of the process, so we released it as a Beta feature which basically means we want you to help us make it better before we roll it out to all users. This is a slow roll-out, meaning you might not be in our random group of users who see the new layout when you log in. Please be patient — we want to make sure we get this right so we’re not going to make it live to 100% of users for a little while. 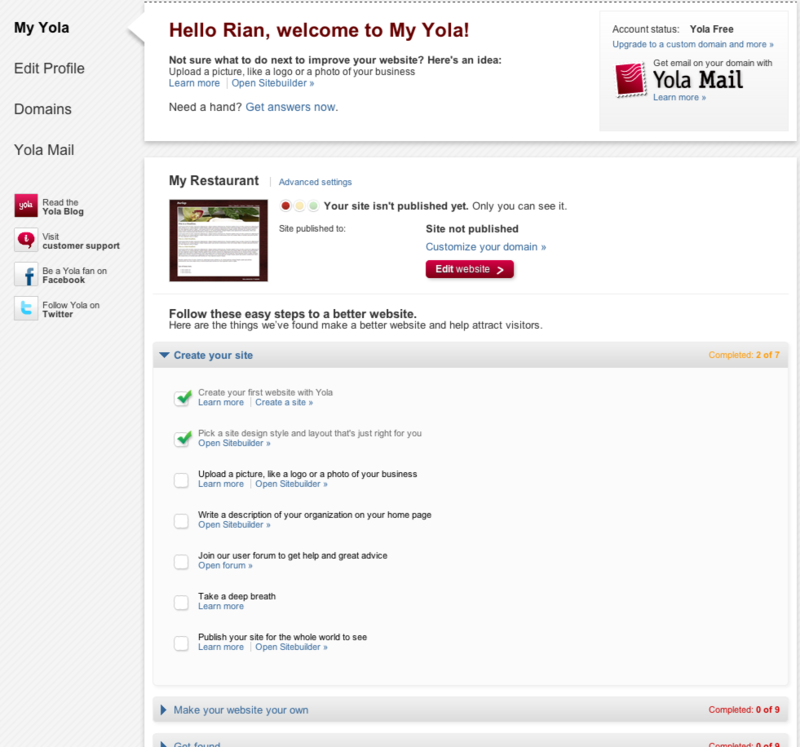 Above all, you’ll notice that the new My Yola is about you, and how to make your website better. We’ve spent a lot of time talking to users and we now know you want us to help you to build the best-looking website for your business, to get found on search engines like Google, and to communicate with your visitors in a meaningful way. So we created a guide with detailed steps to get you where you need to be, and lots of tutorials and tips on how to make your website better. The top of the page helps you focus on one thing you can do right now to make your site better — that will change as you complete the different steps. We also know how important it is for you to know the status of your website — is it published? Have I made changes that aren’t live yet? What is my domain name? The top part of the page is devoted to showing you this information clearly so you can get on with what’s most important — making your site better. As you can see below, the bottom of the page is filled with more tutorials, the latest Yola news, and an easy way to get answers to your questions. There is much more, but this is where we need you to try it out yourself… And don’t forget to send us your feedback and let us know how we can make it better! I have am a fan of Yola. I have several free sites. They are easy to use and I have had minimal problems loading what I want. I an concidering much more with Yols sites in the future. I’m looking forward to checking out the new. God bless your efforts. I just transferred my website to Yola. Wow, am I pleased! I’m no techie so I appreciate the ease of designing and customizing my own site. Thank you! I’m also paying about one third of my previous hosting fee, with more features. You guys are great! I use to use Yola and then moved to Dream weaver because you can create a template and edit the width of your pages, change the navigation bar, customize is in everyway possible. Yola felt like it limits you too much. We agree, there are options with more flexibility, but they tend to require more technical ability. We strive to make the Sitebulder easy to use while still offering lots of customization options, but we agree, we’re not for everyone! Glad you’ve found something that works for you. Could we get the ability to see how many people visit our website too? I’m just thinking that it may be useful for people who are selling products or, like myself, selling authorial services. For someone like me who has limited technical ability, finding Yola was like finding water in a dessert storm. The ease to build a site for any lay person requires only a minimal learning curve. Anyone can have a professional looking website up in no time at all. I LOVE MY YOLA! Thanks for your glowing testimonial Debra, and good luck with your organization! I’ve recently tried a couple of other website-building sites, and found they were all lacking some of the features available in Yola. Sure, all the features are available in one or the other, but Yola is the only one that had all of the things I need, presented in an easy-to access form. I’m staying here, thank you!